The Lake District is an area with stunning scenery located within in the County of Cumbria. Commonly known as The Lakes or Lakeland it was granted National Park status on 9th May 1951 less than a month after the first UK designated National Park, The Peak District. It is the largest of thirteen National Parks in England and Wales and the largest in the UK after the Cairngorms. The Lake District National Park itself covers an area of 885 square miles and stretches 30 miles from Ravenglass in the west to Shap in the east and 35 miles from Caldbeck in the north to Lindale in the south. Crammed with so much natural beauty the Lakes attract visitors, tourists and holiday makers from all over the world. As the name suggests there are many lakes each with their own uniqueness, amenities and activities such as lakeside walks, sailing, waterskiing, boat trips and ferries. All of the lakes except Bassenthwaite Lake are named by water, tarn or mere and are surrounded by stunning scenery and magnificent fells. There are some wonderful towns to explore such as Keswick, Windermere, Ambleside, Kendal, Hawkshead, Grasmere and Cockermouth all with a splendid mixture of shops, cafes, pubs, bars and restaurants. There are also many museums, theatres, historic homes, gardens and many easy walks for the not so energetic visitor wishing not to climb the fells. William Wordsworth the famous British poet was born in Cockermouth and later lived in Grasmere where he wrote some of his best works before moving to Rydal Mount near Ambleside for his last 37 years. Both places are open to visitors and so is Brantwood home to John Ruskin until his death. Samuel Taylor Coleridge, Robert Southey and Thomas de Quincey all followed Wordsworth to the Lake District. Arthur Ransome, author of Swallows and Amazons, also grew to love the lakes and settled in the Winster Valley near Windermere. The painters Thomas Gainsborough, JMW Turner and John Constable were early visitors to the lakes but it was John Ruskin who settled here at Brantwood on the shore of Coniston Water. Farming and especially sheep farming has been historically and still is the main industry of the Lake District. The tough Herdwick breed with their stocky build and distinctive grey coat are especially hardy for the Lakeland fells and its weather. Sheep farming has probably been here since Viking times and is an important factor both to the economy of the lakes as well as in preserving the stunning landscape which attracts visitors and hence income to the region. Great Langdale and its neighbouring valley Little Langdale are known simple as Langdale. Great Langdale beginning at Skelwith Bridge is a u-shaped valley formed by glaciers whilst Little Langdale is a hanging valley. The Langdale valley contains two villages Chapel Stile and Elterwater and a hamlet at High Close. The two villages were centres of the Lakeland slate industry. Elterwater Quarry, being the largest, and Spout Cragg Quarry are still working using modern methods and are operated by the Burlington Stone Company. Other local quarries have now fallen into disuse. Langdale was also an important site during the Neolithic period producing stone axes created on the slopes of the Pike of Stickle. It also supplied stone for some Bronze Age items. Neolithic cup and ring marks can be found on the Langdale Boulders at Copt Howe. Langdale is home to Crinkle Crags, Pike of Blisco, the Langdale Pikes and Bow Fell which is the highest fell in the dale attracting walkers, climbers and fell runners. Scafell Pike, Cumbria and the Lake District’s highest mountain can also be climbed from Langdale. Dungeon Ghyll is a ravine on the north side of the valley that starts on the fell slopes between Harrison Stickle and Loft Crag. It is a narrow and a No-Through Route for walkers. The waterfall is known as Dungeon Ghyll Force. Old Dungeon Ghyll Hotel was originally a farm and inn bought by historian Professor G.M. Trevelyan who donated it to the National Trust. The hotel and the Hikers Bar have a long association with climbing and many famous climbers have stayed at the hotel or drank in the bar. Further down the valley nearer to Chapel Stile there is the New Dungeon Ghyll hotel built in 1862. Bow Fell at 902 metres (2,959 feet) is the sixth highest mountain and one of the most popular fells of the Lake District. The pyramid-shaped mountain situated in the Southern Fells is listed as one of Alfred Wainwright’s ‘best half dozen’ Lake District fells. 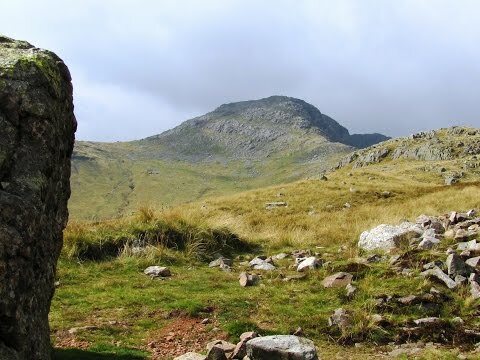 The Southern Fells, which includes the highest ground in England, form a horseshoe beginning with Scafell and Scafell Pike in the west and then curves around the north of the Upper Eskdale valley to take in Great End, Esk Pike, Bow Fell and Crinkle Crags. The summit area is a ridge running north-south with the final pyramid near the southwest corner and crags on three sides. The highest point is a rearrangement of some loose rock at the apex of the pyramid. The panoramic view is excellent. Every major group of fells in the Lakes can be seen from this superb vantage point. To the north west of Bow Fell the main ridge drops to the depression of Ore Gap, named after its reddish soil rich in haematite, then climbs to the summit of Esk Pike. Below the northern side is Angle Tarn which is a round lake of about 50 feet deep. The tarn occupies a corrie beneath Hanging Knotts and its outflow is a tributary of the Langstrath Beck, making for Stonethwaite. The ridge to the south of the fell falls steeply to the depression of Three Tarns, which takes its name from a number of small pools, and separates Bow Fell from Crinkle Crags. Bow Fell sends out two subsidiary ridges to the east. One ridge begins at the northern end of the summit plateau and crosses a sharp depression at the head of Rossett Gill before reaching Rossett Pike. This ridge continues to connect the Southern Fells to the Central Fells, forming the northern wall of Great Langdale as it crosses Martcrag Moor making for the Langdale Pikes. The other ridge, named The Band, descends from the southern end of the summit plateau making straight for Stool End Farm on the valley floor. This ridge which divides Oxendale from Mickleden has a minor top halfway down named White Stones. The Band reaching up to 568m and is the most popular means of ascent to Bow Fell. The Cumbria Way is a 70 mile long distance footpath passing through the heart of the Lake District National Park linking the two historic towns of Ulverston and Carlisle. The route cuts through the most beautiful Lakeland countryside via Coniston, Langdale, Borrowdale, Derwent Water, Skiddaw Forest and Caldbeck. The Cumbria Way was originally developed in the 1970’s by local Ramblers’ Association members and is mainly low level but does contain some high level exposed sections and the highest point is High Pike at 658 metres (2,159 ft). The waymarking of the entire route was completed by volunteers and national park staff in May 2007. We turn right out of the car park and walk down the road and when the road turns sharp left we head forwards through the gate and follow the track to Stool End (farm). After going through the gate at the other side of the farm for a short way we take the steep uphill path on the right to take us up The Band. We keep following the path uphill and eventually up some steps towards the skyline. Just before the Three Tarns at the skyline we turn right uphill, this is very slippery with loose rock. At the top we start to bear left following the path to the summit of Bow Fell. We then bear right following the cairns to Ore Gap which is the dip we can see in the distance just below Esk Pike. At the dip we turn right and follow the path, a little vague in places, steeply downhill towards Angle Tarn on our right. At the tarn we cross over the stream and head forwards uphill on the distinct path. We go over the brow and follow the path downhill to the valley below. At the bottom we turn right and follow the Cumbria Way along side Mickleden Beck to Middle Fell Farm and the Old Dungeon Ghyll pub. We pass through the car park and go through the gate to follow the path with the beck on our right, running parallel to the road until we arrive back at the car park. This is a hard walk on mainly good paths and tracks except the ascent from the Three Tarns towards Bow Fell summit is very slippery with loose rocks and also the descent from Ore Gap to Angle Tarn is a little vague in places. Elevation: Approx lowest point 90.20m (296ft) approx highest point 893.20m (2930.45ft). Approx 8.6 miles allow 4½ to 5½ hours using OS Explorer Map OL6, The English Lakes, South-Western area. Start point: Dungeon Ghyll National Trust car park half a mile west of Chapel Stile. The Langdales are in the south-western area of the Lake District, Cumbria. From the A66 at Threlkeld take the B5322 on the left. At the t-junction at Legburthwaite turn left onto the A591 by the side of Thirlmere. At Ambleside take A593 following the signs for Coniston. At Skelwith Bridge turn right onto the B5343, continue through Chapel Stile and after about half a mile there is a car park on the left and another car park with public toilets on the right at Dungeon Ghyll. Parking: Two National Trust pay and display car parks at the New Dungeon Ghyll, £7.00 for all day and also a car park at the Old Dungeon Ghyll pub. There is very limited free road side parking. There are public toilets in the car park next to Old Dungeon Ghyll Hotel. For refreshments there is the Old Dungeon Ghyll Hotel and Hikers Bar, further down the valley there is the New Dungeon Ghyll hotel and at Chapel Stile half a mile back down the road towards Ambleside there is a shop, a cafe and Wainwrights Inn.